Last Saturday the 12th July I was due to leave on a late flight for a fortnights holiday. It was such a lovely day that my Mum decided that it would be great opportunity to make the most of the trip and stop somewhere nice for the afternoon. 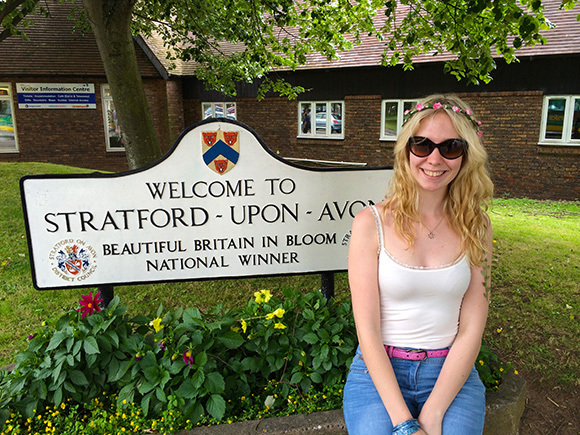 We decided on Stratford Upon Avon, it is a beautiful town with plenty of history and makes a great place to wander around on lovely summer’s day. We arrived just after lunch and there was boating regatta taking place on the river so the town was bustling with extra visitors. My Dad dropped us in the town centre and went off to find somewhere to park the car. My Mum suggested that we take a walk down to the Royal Shakespeare Company theatre and have a look around. It was full of interesting displays and little gift shops. When my Dad caught up with us we decided to have a wander around and get a better feel for the place. Arriving in Stratford Upon Avon for the afternoon. 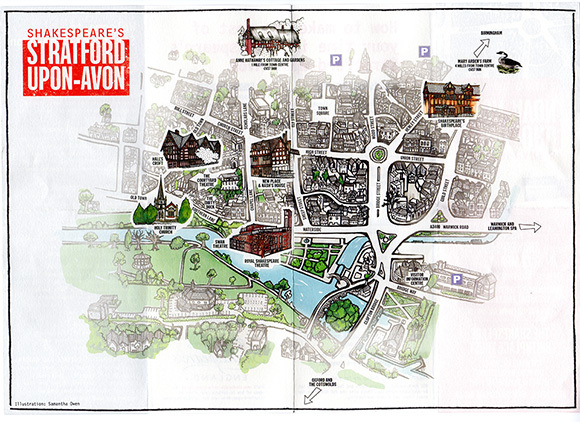 We picked up a street map to help make the most of our time in the lovely town. 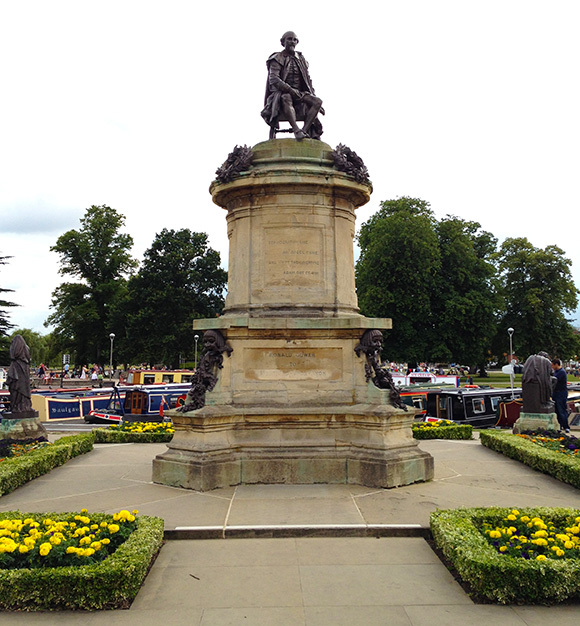 We walked past the statue of William Shakespeare on the way in to the town centre. 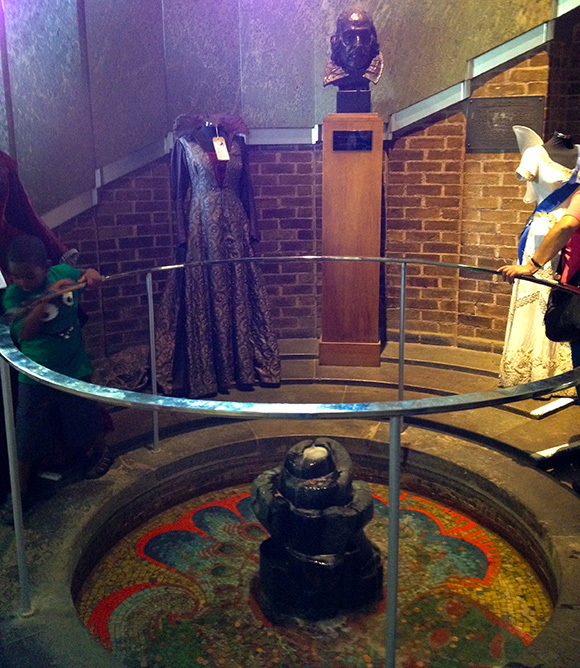 This display was inside the Royal Shakespeare Company theatre situated on the river bank. Tom could not resist one last photograph before we finally got back to the car park. I hope you have some wonderfull hollidays !!! Thank you Randall, they’re not a patch on yours. Wonderful pictures! Glad you enjoyed your day! It was great, Mum comes up with these ideas on the morning we leave, that’s what I love surprises. There are lots of stunning buildings and a wonderful river and parkland to walk through full of weeping willows, I only put a taste of the day, it was lovely weather and we had a lovely time drinking milkshakes, we just wished we’d had enough time to stay for a show in the evening. Lovely photos, Charlotte, makes for a lovely holiday. Have fun! Thank you Janice, so exciting to break an otherwise long boring journey up. Holiday.. wow, that’s a rare one for you, eh? Hope you have a fab time; you deserve the break. It is rare yes, especially two weeks! My parents usually only ever get one week off or ten days if they can do it over two weekends so I’m not used to it. I started practising and learning new rep in the second week 🙂 lol. I can just imagine you telling clients they could get it cheaper lol. I had a lovely time. A great break from my routines. That was wonderful. You look so pretty. Thank you, the flower garland was from the Shakespeare RSC shop so many lovely gifts in there. I was so hot in my jeans too I rolled the legs up. It’s nostalgic remembering Stratford-Upon-Avon as a student in the days gone by . . . Shakespearean’s plays & all that. Fabulous Paul, happy to bring back good memories. 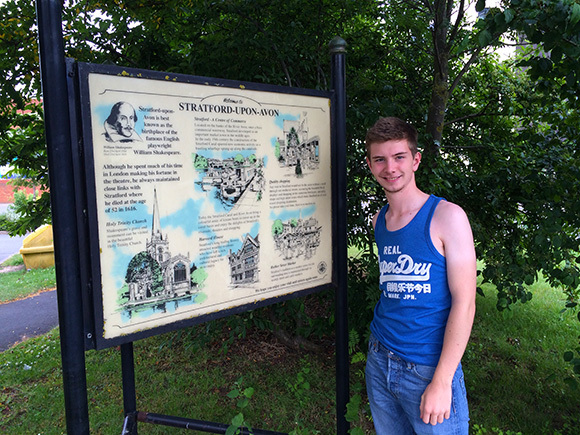 My brother studied at Warwick University and although we visited Leamington Spa a lot and Warwick we never did make it to Stratford but I will go back it was just lovely. Wonderful pictures. Looks like you were having a great time. Should put you in a mood for Verdi’s Otello. Interesting that you ended up in Shakespeare’s hometown. I have been thinking a lot about the Bard lately. Just watched a course on Shakespeare, have watched several of the plays on film, and have been doing some reading. Am thinking about devoting Wednesdays next year to Hamlet. Sounds like a good idea to me Don, I hoped to study Shakespeare this last year but the module didn’t fit with my program so I had to choose something else. There was a book of curses for sale I don’t know why that drew me to it in particular but it was very funny. Lots of good photos. Have a lovely holiday! Stratford is super. We spent a day there after reaching nearby in a narrowboat. We had one day of pouring weather. I still piloted the boat out in the rain (summer) while the girls sat around looking at the view and doing girly things inside. Stacks of room. Fortunately no locks that day! Thanks Stephanie, new things to learn, new culture and fabulous weather. Thank you for sharing these wonderful photos! They brought back some lovely memories. We lived in Warwickshire when my sailor did a course with the British Army. 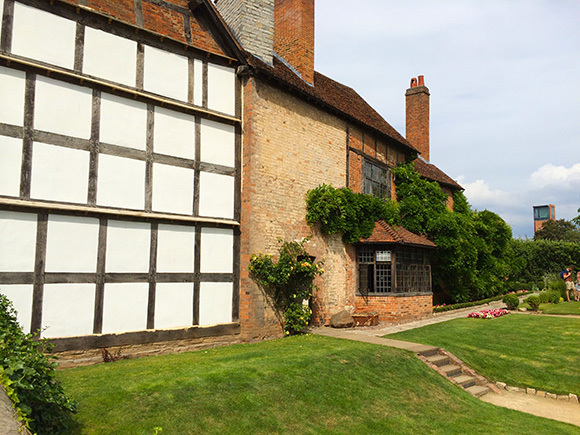 I went to Stratford as often as possible to wander around the town centre, tour the Shakespeare venues, even to do my grocery shopping. Enjoy your holiday! So happy to bring back good memories to you. It was so beautiful, in the north of England and in Central Glasgow I think planners lose their way a little without planning in more green space, trees and beautiful natural things to link up with the architecture and give people nice walks to enjoy. Thank you 🙂 glad you enjoyed them. Oh my goodness! Such wonderful photo’s, the opportunity you have to see so much! Sharing them is a gift to us, thank you. Thanks Candi, I grew up in a town without much cultural activity or historical buildings so to see such beautiful towns with so much heritage is lovely because where I went to school in Knutsford is very quaint and historic so I learnt to appreciate it more as it wasn’t just on the doorstep. Stratford-upon-Avon is a lovely town, although I think one gets to understand more of Shakespeare’s spirit at the rebuilt Globe Theater in London. I’ve not been to the rebuilt Globe Theatre another place on my list to go. I’m on a course in London in August but I’m not sure how much time we will have to adventure in the evening. Such a shame we didn’t have the time to stay for a play Jeff, so excited for you that you got to see Peter O’Toole live.